Compiz sometimes behaves badly. 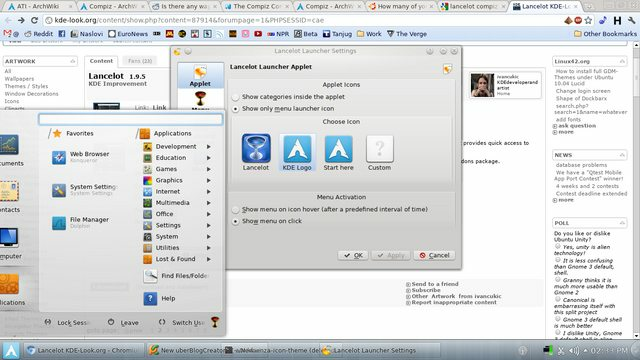 The only solution that I can think of is to set some special rule (if Compiz has those) for Lancelot's window. I am a former Windows user that just become KDE SC 4 user and I am very impressed with Lancelot Menu as it was very customizable. I have some request that maybe just my personal taste. 1. Can you make the picture for Lancelot Menu launcher button wider instead of scale it to square-like shape? 2. Can you implement one optional feature again that allow user to hide the left category tab (Documents, Contact, Computer, Applications), instead of just "Make buttons narrower" by right clicking on top of each category and use option menu to make them show again? 3. 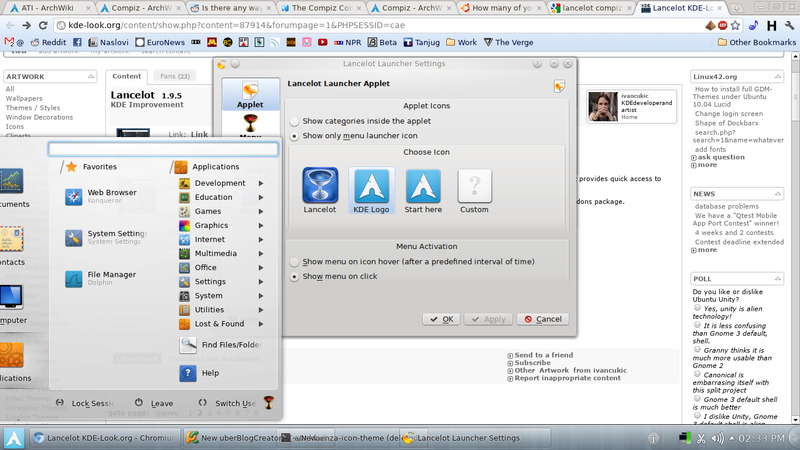 I try to push "Alt + F5", but Lancelot Menu appear at center screen instead at bottom left screen (my current Lancelot Menu button position), can you make Lancelot Menu appearance following the launcher button position. 4. Can I use "win" key on my keyboard as replacement for "Alt+F5" to show Lancelot Menu and push it again to make Lancelot Menu disappear(as in Microsoft Windows)? 4) You can't do this - due to issues with the KDE Shortcut system and/or Qt - at least out of the box. You can however use XBindKeys to turn the Windows key into a regular key - which will then allow it to work. 1) I believe this is determined by Plasma itself - and Lancelot cannot work around it. It would be nice to have the option to remove Lancelot once it's installed. Because Lancelot is too buggy I got tired of it and went back to kicker but I'm stuck with the lancelot icon in the panel. I'd have to create a whole new panel to get Lancelot out of the way, not very great. Geoffroy wrote: It would be nice to have the option to remove Lancelot once it's installed. Because Lancelot is too buggy I got tired of it and went back to kicker but I'm stuck with the lancelot icon in the panel. I'd have to create a whole new panel to get Lancelot out of the way, not very great. It woud be when the contact list woud support telepathy and not only kopete. That is something planned (already had some proof-of-concept code) but I'm gonna wait until telepathy becomes stable enough - aka doesn't force me switching back to kopete due to missing messages and similar. ivan wrote: aka doesn't force me switching back to kopete due to missing messages and similar. RyanBram wrote: 3. I try to push "Alt + F5", but Lancelot Menu appear at center screen instead at bottom left screen (my current Lancelot Menu button position), can you make Lancelot Menu appearance following the launcher button position. May be it's a wrong thread, but how can one configure font colors in Lancelot? In my present theme it looks horribly with black font on dark transparent background, which makes it almost unreadable when it opens above some black windows (like terminal for example). Is it possible to set font colors to white? That's a problem of your custom theme. I had the same problem while using the Elegance theme (and those two other themes i don't remember), but since i changed to Oxygen i have those white fonts back. In your screenshot i see some empty blocks (corners) around your system buttons. That happens sometimes in Lancelot if you are using older themes that aren't up to date to recent changes in KDE. What theme and colour scheme do you use? I use Debian testing and installed the theme through KDE UI (of getting additional themes). > May be it's a wrong thread, but how can one configure font colors in Lancelot? Please use this thread *only* for feature requests and ideas to keep it clean. So, if you want to report a bug, do so on BKO. If you want to discuss something else about Lancelot, or to make an inquiry on what and why, create another theme, or contact me on IRC.